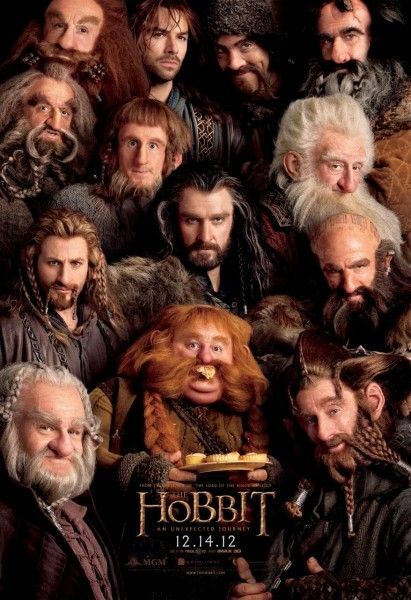 A new dwarf-centric poster for The Hobbit: An Unexpected Journey has been released. We recently saw a new poster for the film that featured Martin Freeman’s Bilbo in a familiar pose, and this one-sheet gives us a look at all of Bilbo’s dwarven companions that accompany him on the titular trek. It’s a fun look at all the characters, and I think it gives onlookers a sense of the varied characteristics of the dwarves. Hit the jump to take a closer look. Directed by Peter Jackson, the film also stars Ian McKellen, James Nesbitt, Stephen Hunter, Mark Hadlow, Graham McTavish, Dean Ogorman, Peter Hambleton, Aidan Turner, Jed Brophy, John Callen, Adam Brown, Ken Stott, William Kircher, Andy Serkis, and Richard Armitage. The Hobbit: An Unexpected Journey opens in 3D on December 14th.